Bringing its unique Italian style to the kitchen for over 100 years, Smeg has always managed to surprise and delight with its unique and colourful designs. Smeg hobs are no different, offering a range of clever and practical gas and electric hobs to suit any kitchen, big or small. 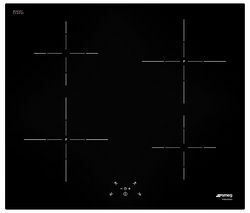 The Smeg hob range includes gas, ceramic and induction hobs that are designed to look great and clean easily. Smeg uses cutting-edge technology to construct its Hobbs, using only premium materials. Whatever look you’re going for at home, you’ll find a range of durable materials to choose from, including stainless steel, glass, and cast iron (pan stands). Flat surfaces make for easier cleaning, while hobs like the Smeg SE2664CX2 feature simple touch controls rather than buttons or dials that can be so fiddly to clean around. Smeg’s extensive range is also available in a choice of sizes and finishes that are built to coordinate perfectly with Smeg’s integrated and freestanding ovens. Choose your desired number of burners or preferred cooking zone layout to suit your needs, from dual zones and burners for smaller kitchens, right up to six burners for more flexible cooking options for larger households. High-performing hobs offer giant zones, or ultra-rapid and high-performance burners, ideal for wok cookery, whose near-vertical flame guarantee excellent cooking results. For even safer electric cooking, Smeg’s electrical induction hobs use magnetic fields to agitate the metal in the pan, turning your ferrous metal cookware into the heat source instead of heating the hob itself. This clever, cutting-edge tech leaves these flat-surface hobs safe to touch while giving you a heat source that’s just as responsive as gas, but far more efficient, using only the energy it needs to heat the pans. For a wider range of sizes, designs and prices, take a look at our full selection of gas hobs and electric hobs to get cooking with style.